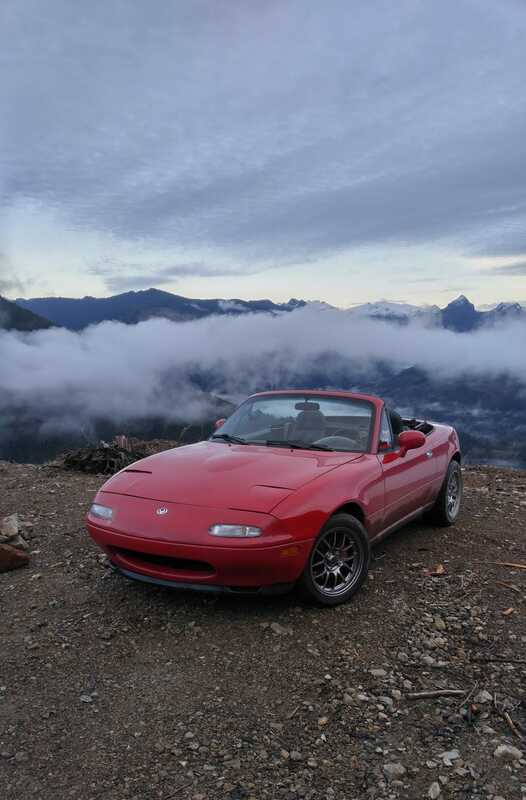 Sharing my current plans for my Miata. The original goal was to make a faster, more luxurious Miata that would excel as a daily driver. Now I’m leaning away from the luxury, and trying to turn it into an absolute rocket, both on-road and off. This is my overlanding vehicle as well, so anything that can get me through rougher terrain or help m carry more gear without resorting to a trailer is a big plus. If you haven’t read the first part, Aka what I’ve already done to this beast-in-the-making, give it a quick look. Miata Build, Stage One - "Heart, Soul and Wallet"
Turbo! This is still at least 6 months out. I need to save up. I’m 100% set on going through Trackspeed Engineering after talking to people familiar with multiple Turbo options on Miatas and spending days going through the forums. Their turbocharger system includes “our EFR-specific manifold, a BorgWarner EFR B1-frame turbocharger, EFR-specific inconel exhaust studs, a stainless 3" downpipe, and our EFR-specific braided oil and hard coolant lines.” I’ll need to source a lot of things but that’s fine. Seems to be the best setup on the market for what I want, which is roughly 225whp with the potential to bump it up without diminishing responsiveness. Roll bar. When I’m drifting on cliffsides I feel the absence of a rollbar very strongly. This will be taken care of soon, although I’m not sure if I want double hoops or the standard rollbar style yet. It’s a bit of a pain finding something that fits with a soft top, is usable with a hardtop and allows my seats to go all the way back. Leaning towards the standard style over the hoops, but still conflicted. Fixed back racing seats. I purchased one seat, still need the other, as well as brackets. This is a knockoff (I ordered it without the logo as such, but they were out and “upgraded” me for free) but I’m absolutely amazed at the quality they put into it for the price. These will go in as soon as the roll bar does. Racing harnesses. There is no way to use the stock belts in a safe way with the new seats so racing harnesses are a must. Convenience goes down, cornering confidence goes up. I’m okay with this. There’s a DOT approved Schroth 4 point harness that can be upgraded to 5 or 6 point very easily. That’s the one I’m eyeing at the moment. It’s also street legal. Soft top. I’m so tired of having horrible leaks on all the rainy days (I live in Seattle) and fogged up/frosted over interior windows on all the super cold days due to the numerous rips, holes, frays and whatnot in my top. When I bought the car, there was also a large duct-taped hole in the rear plastic window. I ended up making a DIY window out of plexiglass with mixed results. Visibility was vastly improved, but it leaks a bit around the bottom even after a few coats of marine goop, and I used a thick piece of plexiglass so that you have to unzip the window when putting the top down. The plan is to get a Robbins top with glass window, and all new seals. Right side, left side. The soft top is literally help together with tape and glue. Exhaust. I already have what I consider the ultimate NA Miata exhaust, sitting in my bedroom. Fujitsubo RM-01A. Waiting on the weather to install. The bolts I need to loosen to remove the stock catback are currently rusted AND frozen. Yay. I’m obligated to tell you I got these images from supermiata. Suspension. The other “ultimate” mod imho. Xida Coilovers, duel spring setup with new NB top hats. Decided to let a shop tackle this one. I just don’t have the wrenching confidence to do this job right (the coilovers were 80% of the cost of my car). This might actually be the next thing I have done, depending on the price I can get. Wheels! Bought a single Advanti Racing Storm S1 in black to see how I liked the color. 15x8, aggressive offset. So... I love ‘em. And at roughly $100 a piece they’re dirt cheap for a wheel this light. I should buy 3 more and make them my summer wheels. But a small nagging voice in the back of my head keeps telling me to save up and buy some nice forged wheels, one at a time. I try to save money, I really do. It’s these damn voices that keep influencing me to buy more car parts. Smh. Here’s the three other wheels I’m considering.... All forged. All gorgeous in their own unique way. Top left Advanti Storm S1, which I have one of already. Top right SSR wheels in spectrum silver. God I cannot get enough of that finish. Bottom left Volk Te37's. I’ve wanted a set in bronze for awhile. Bottom right are an MSR Wheels prototype. luggage rack. I’m doing a 4 week road trip from Washington down to California, then to Nevada, Colorado, Utah and Idaho. In the Miata. With a friend. Camping and couch surfing. Definitely need some extra storage hacks. The NA version looks the same, flush follows the trunk line a bit differently. Removable! Shifting duties. I’ve read great things about the Miataroadster short shift kit and I’m definitely going to put that in my rice rocket sometime in the near future. Once I get the above kit, I want to jazz up the neglected interior a bit. Burstcraft sells a pretty cool shifter I’ve been looking at for awhile. Tell me that’s not gorgeous. I’m thinking a gunmetal grey though. Momo Mod 80 steering wheel. I’ve used a lot of wheels, this is my favorite in terms of feel. It also looks awesome. Pretty easy choice. Heat shielding and sound deadening. I still want to try this, but I’m honesty not sure if there’s anything that can make a Miata quieter at highway speeds. Garage Star Minimalist Center Console. God I love this. I’ll lose the very useful center storage bin, but my interior will look SO much better. Especially with the Burstcraft knob sticking out. A block off plate for the center console is included so I have no idea why they took product photos without it. Floor mats. Mine have holes in them. Nuff said. Garage star e-brake lever grip in silver. I took my e-brake handle off because it’s plastic and ugly. Time for an upgrade. Plates. I’ve never had a custom plate. I really want one. First choice is currently 2jdm4u (I’m trusting you oppo, if you steal that I’ll die inside). Used the DOL’s custom plate configurator to get this realistic rendering. And that’s everything I’m planning! Well, not really, but I’m typing on a phone and my hands hurt so this will do. Congrats for making it this far and if you’re in the western half of the United States and want to drive a modified Miata in April/early May or just hang out we could probably work something out.